Lexington Houses Blog: 7 Tips for Selling Your Lexington Home This Holiday Season! 7 Tips for Selling Your Lexington Home This Holiday Season! Now that the holiday season is in full swing, the hustle and bustle of shopping, parties and events has everyone in a festive spirit! Yet, there are those of you who may have your attention divided during the holidays if your Lexington home is currently on the market. Selling your home this time of year may seem impossible, but there are buyers out there who like to take advantage of not having as much competition! In fact, selling your home during the holidays can have an advantage! Buyers get to see your home in the best light with appealing holiday decorations, cozy atmosphere and the joy of the season as a backdrop. These elements can help buyers envision themselves hosting their own holidays in your home! As a Lexington Real Estate agent, sellers ask me all the time what they can do to help their home sell. Below you’ll find seven easy tips that will boost your Lexington homes’ appeal this festive time of year! 1. 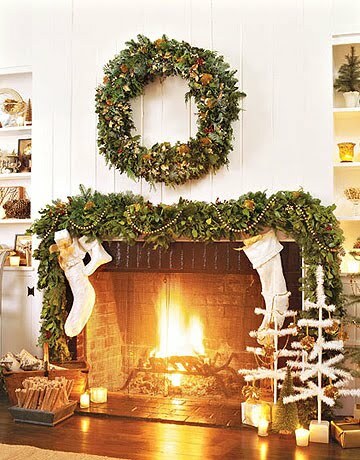 Highlight the Highlights- Draw attention to a beautiful fireplace mantle with a few tasteful ornaments or enhance an arched doorway with hanging mistletoe. 2. Add Holiday Adornments- Again, you don’t want to go overboard, but a simple evergreen wreath, a poinsettia center piece or light holiday decorations can create a very warm and welcoming atmosphere. Of course it’s best to avoid overly religious flourishes as this can be off-putting to some. 3. Complement Your Décor- You’ll want to make sure that your Christmas decoration palette matches or complements your current décor. If the colors clash or seem to be fighting for attention, this can be very distracting to buyers and can take away from the great features of your home you’re trying to highlight. 4. Give Warmth- Just before a showing, be sure to turn up your thermostat a few degrees to make it extra toasty inside. Put a fire in the fireplace to add an extra sense of warmth and highlight the cozy atmosphere that this feature of your home can bring. 6. Mind the Tree- While a tall Christmas tree can showcase a two story living room, be sure to be careful of the tree’s width. The last thing you want is to have your Lexington home appear smaller than it really is. Also, you’ll want to stick with a cohesive theme for your ornaments. The family homemade ornaments can be meaningful to you, but can quickly make your tree look gaudy to outsiders. Keep it simple this year and remember, there’s always next year when you can display those keepsakes in your new home! 7. Offer Tasty Treats- While you don’t want to come across as trying to bribe buyers, everyone loves holiday treats and having a plate full of cookies and candy can make the home showing a little sweeter. Hot chocolate and apple cider are always welcome and buyers will feel that you have their best interest in mind. Buyers will be drawn to your Lexington home if you follow these tips for showcasing your home at its’ best! Of course, I’m always available to answer your questions about selling your Lexington home, and would be happy to help you throughout the entire home selling process!